I like snakes. Actually, I love snakes. Bigger is better, and that's one reason why I've got so many retics. Reticulated pythons are arguably the largest of all snakes. As far as I'm concerned, that's a large part of their appeal. In the last few years, more and more people have come to share my feelings about these incredible animals. Reticulated pythons have the largest natural range of any python, inhabiting a huge area of tropical Southeast Asia including the Malay Peninsula, Borneo, Java, Sumatra, Timor, Ceram and the Philippines. They have adapted well to the encroachment of humans into their habitat, successfully establishing themselves in agricultural areas and even cities. They are fairly nonspecialized predators and are able to utilize a wide variety of prey animals, from mice and birds to some of the smaller hoofed mammals. Wild city dwelling retics can subsist on a diet of rats, dogs and cats, while their country relatives live on any other warm-blooded animals that they can subdue and swallow. Physically, reticulated pythons are similar to other python species. They are longer and more slender than other pythons, however. Retics, especially the smaller individuals, do not have the heavy-bodied proportions of Burmese, blood or ball pythons. Most retics have a pattern of diamond shaped blotches dorsally bordered with black and yellow. Each blotch is associated with a white spot on either side of the snake. The word "reticulated" means netlike, as their pattern somewhat resembles that of a net. The word has also been used to describe the patterns of certain giraffes and a subspecies of Gila monster. (I did get a call one time from a novice snake keeper asking for the best course of action should his pet python start trying to "reticulate" him!). In the normal, wild-pattern type, a narrow black line starts at the tip of the nose and runs into the first blotch on the neck bisecting the head. Another narrow black line extends caudally from the eye to the junction of the jaws. Ground color of the wild animals varies from blue gray or silver to brown. Depending on the origin of the wild stock and individual variation, the snakes can exhibit varying amounts of yellow and black coloration. All can change color to some degree depending on temperature, mood and time of day. Most well maintained individuals have a beautiful iridescence in natural sunlight. Reticulated pythons are undemanding captives and have the same requirements as most other boas and pythons. I keep mine in relatively small enclosures. I raise my baby retics in 28-quart Rubbermaid plastic boxes measuring 20 by 14 by 6 inches. The snakes are moved to proportionately larger cages as they grow. Most adult retics can live comfortably in a cage measuring 36 by 72 by 36 inches. Smaller reticulated pythons may climb a little, but larger snakes are strictly terrestrial. Floor space is more important than the height of the cage. Plastic cages work well; wooden cages should be painted and sealed to eliminate heat loss (more about that later). In addition to keeping the snake confined the enclosure must maintain a healthy environment. Temperature and humidity are the most important parameters. As with most pythons, it is beneficial to provide relics with a temperature gradient. This provides the snake the opportunity to choose a temperature to its liking. A temperature range of 80 degrees Fahrenheit at one end of the cage to 90 degrees at the other is satisfactory. Strangely, retics, when given a choice, will often choose temperatures much cooler than this. I've seen reticulated pythons voluntarily choose temperatures in the low 60s when warmer temperatures were available. Because most pythons require temperatures higher than we would find comfortable in our homes, you'll need to use supplemental heat to provide the proper temperatures to keep the snake healthy. A retic cage can be heated by a light bulb, ceramic heater or heat pad. The method of heating the cage is not important as long as the proper temperature is achieved. The supplemental heat source should be located at one end of the enclosure in order to provide the maximum temperature gradient. Monitor temperature on the floor of the cage because this is where the snake will spend most of its time. Retics like a high level of humidity. These snakes come from tropical areas that receive large amounts of rainfall. They are most active at night when the air is most likely to hold more moisture (during the day, they usually remain coiled in a damp hiding place). For captive retics to shed properly, 70-percent humidity levels should be maintained. Under these conditions the snakes will look and feel their best, and when maintained properly, reticulated pythons can exhibit some of the most impressive iridescence in the reptile world. Humidity can escape the cage through ventilation holes, unpainted wood and unsealed joints and cracks. Although you don't want to have a completely airtight cage, it is not necessary to provide as much ventilation as you might think. Because heat rises, vents placed on the top of the enclosure will permit more heat loss, requiring more heat to be added. This cycle dries out the cage. Instead, place small vents on the sides of the cage. I use a newspaper substrate in my retic enclosures. Newspaper is absorbent, relatively sterile and readily available. Other substrates may provide a balance between utility and aesthetics. Cypress mulch maintains humidity in the cage and is resistant to decay. Other wood products rob the cage of moisture and can be dusty. For small snakes, indoor/outdoor carpet may be acceptable. It is only during the last 10 years or so that reticulated pythons have been bred regularly in captivity. Prior to this, most python keepers had formed their opinion of the species from imported wild-caught snakes. These animals generally had unpleasant dispositions, and handling them often resulted in the shedding of various bodily fluids by both parties. For many years, reticulated pythons were regarded as unsuitable captives by a large percentage of reptile keepers. In 1992, the first tiger reticulated pythons were produced in captivity (more on this later). These were attractive animals that caught the attention of many snake keepers. Much of their appeal was due to the fact that these snakes were tame and not at all like the retics with which most reptile enthusiasts were familiar. As the popularity of the tiger retics grew, more and more people came to keep and appreciate retics. With pet reticulated pythons becoming more common, it has become apparent that the retic's reputation as an aggressive snake is not deserved. In my opinion, reticulated pythons are similar to Burmese pythons in disposition. Captive-born and raised snakes of either species are quite tractable. On the other hand, wild-caught specimens of both types can be very aggressive. I'm sure, in a wild snake's little mind, every time we pick it up it assumes we are a large predator that intends to have it for lunch. As long as I'm being a cheerleader for retics, let's address another concern many people have about keeping them: their size. As I've mentioned, retics may well be the largest of the snakes. Certainly, they reach large sizes more consistently than anacondas. Many people have reservations about keeping a snake in their homes that may reach 30 feet in length and weigh more than any two family members put together. Reticulated pythons definitely aren't for everybody and every situation (just as not every type of dog is suitable for everyone; there's a reason Grandma doesn't keep a mastiff in her apartment). Large snakes, and any snakes for that matter, should be kept only by people who can accommodate and care for them properly. A python's size is influenced by both genetic and environmental factors. Snakes from populations where large adult sizes are typically reached have the potential to get large themselves. Snakes originating from populations where the average adult size is smaller are likely to be smaller as adults. Older snakes are likely to be larger than younger ones. Females are likely to be larger than males. Snakes that have lived in optimal conditions with plenty of food will be larger than snakes that have lived under less-than-optimal conditions. In the wild, a snake must eat whenever food is available. Physically and behaviorally, the wild snake is the product of natural selection. The physical and behavioral characteristics that a snake exhibits are the traits most suited for its survival in the wild environment. These snakes must take advantage of food when it's available and cope with the situation when it is not. In a captive situation, food can be available at all times and the snake will eat it. Reticulated pythons are able to process tremendous amounts of food and the result can be explosive growth. It is not uncommon for a baby retic that hatches at 28 inches long to reach a length of 10 feet before its first birthday. That said, I must stress that just because the snake has this potential doesn't mean it must, or even should, grow this quickly. It's not always easy for a snake to get groceries in the wild and they are prepared to deal with the flip side of things, as well. During these times there will be little or no growth. As long as the snakes can get enough food to maintain themselves, they will survive. It is possible to strike a balance between the level of food intake that is necessary to maintain a retic in healthy condition and a level that allows for maximum growth. Because a reticulated python can get very large does not mean it must get very large. Healthy wild snakes are prepared to adjust to and survive with a wide range of food intake; captive snakes are equally prepared. In the last few years, reticulated pythons have become available from populations where the average adult size is much smaller than the snakes with which hobbyists are most familiar. Retics from some Indonesian islands may reach only 8 to 10 feet, with females attaining maturity at about 6 feet (even less for males). The retics said to originate from the localities of Jampea and Kayuadi are such animals. I've seen wild, imported female retics from these localities that were gravid, only 6 feet long and weighed only 5 pounds. These smaller snakes are the result of the forces of natural selection in their particular environment. Genetically, they seem to lack the potential to reach large sizes. These smaller retics are becoming very popular. The imported animals are, for the most part, not aggressive. Several breeding groups of dwarf retics have become established in this country and the demand for them is very high. Before and during the 1980s, most of the reticulated pythons imported into the United States came from Thailand. These snakes varied a little in the amount of yellow in their patterns, but they all closely resembled each other. In the following years, retics from Indonesia became available. These snakes looked much like the snakes from Thailand. Recently, reticulated pythons have become available from additional localities and islands in Indonesia. Some of these snakes show subtle differences in size, color and pattern, but, most are remarkably similar to the other retics. Most variation in the appearance of wild snakes is due to genetic mutation that occurs spontaneously and randomly. Most of these mutations, if they affect the snake at all, are deleterious. The affected animals have a reduced ability to survive and reproduce. These traits are not passed to the next generation. In some instances, however, mutations may provide a slight advantage. In these cases, the genes are passed to the offspring. Over long periods of time, the beneficial traits accumulate in an organism and the harmful ones are lost from the population. The cryptic patterns and colors wild snakes have evolved over time are those that serve them best in their particular habitats. In the wild, albinism is a death sentence. An albino snake has difficulty hiding from predators, and its unusual color may alert prey to its presence. These snakes are quickly eliminated from the population. Wild albinos are very rare and it is uncommon for them to find their way into captivity. When they do, I suppose it's because they were unable to hide from the person who caught them! The "rules" are different in captivity. Snakes with unique color and pattern mutations are often more desirable to hobbyists. These animals may receive better care and have more opportunities to breed. They may also be more likely to pass their traits to their offspring. Ten years ago, most of the retics in this country were very similar to each other. Most originated from the same geographic area and no genetic mutations had become established in captivity. 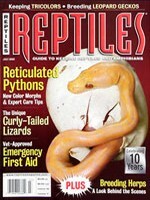 In 1992, a strangely patterned retic was bred by Karl Hermann, then of St. Paul, Minnesota. Half of the offspring from this snake showed the mother's unusual pattern. Karl named these snakes "tiger" retics, and they exhibited varying degrees of striping and, in some cases, lateral duplication of the pattern. Most of the black line on the top of the head was missing and the white spots on the sides were enlarged and elongated. These were some of the first retics to be produced regularly in captivity and were surprisingly good natured, not at all like the retics many of us had kept in the past. Their attractive color and patterns and docile disposition made them immediately popular with python enthusiasts. These snakes awakened a dormant interest in many snake keepers. It was the beginning of the current interest in this species. Almost every aspect of an organism's physical makeup is determined by genes inherited from the organism's parents. Genes exist in pairs, one gene coming from each parent. These pairs come together when an egg is fertilized, develops into an embryo and eventually into another organism with the traits and features of the parents. Most of the python color and pattern mutations currently being bred in captivity are recessive traits. When a snake exhibiting a particular trait, such as albinism, is bred to a normal snake, their offspring will look like the normal parent. Even though the offspring will not look like albinos, they still carry the albino gene. Later, if they are bred with other normal-looking snakes that carry the albino gene, or snakes that are actually albino, their young will be albino. When discussing recessive traits, the gene carriers (the normal-looking snakes carrying the gene) are referred to as "heterozygous" and the snakes that actually exhibit the trait (actual albinos, using the example above) are called "homozygous." Tiger retics, when bred to normal retics, will produce offspring half of which are tigers and the rest normal. This kind of mutation is called co-dominant. Tiger retics are heterozygous for their trait. In the mid 1990s, Al and Cindy Baldogo of Fontanelle, Iowa, bred together two tiger reticulated pythons. The offspring of these heterozygous animals included tigers, normals and some different-looking retics they named "super tigers." These snakes were more striped and more yellow than the tigers. These snakes are homozygous for the trait, having received a copy of the tiger gene from each parent. Super tigers, when bred together, produce all super tiger babies. Bred to a tiger, half the offspring will be tigers and half will be supers. When bred to a normal retie all the babies are tigers. As I bred more and different reticulated pythons I noticed that it was not just my tiger and super tiger retics that were tame. Nearly all of my baby retics were tame and grew into tame adults. I think that captive born retics, or at least newborn retics from any source, are, for the most part, tame. This realization by python keepers has sustained the interest in retics of all types, colors and patterns. In April of 1994, 1 obtained an albino reticulated python from a dealer in Malaysia. From the photo I was sent, the snake seemed to show the familiar yellow and white colors of most albino snakes and no black pigment. Technically, the snake is referred to as amelanistic. When the snake actually arrived at my facility, I was shocked and pleased to see that the white areas (the black pattern of a normal-colored retic) were instead a pleasing lavender color. The eyes were orange with red pupils. This snake did not acclimate to captivity easily. It was extremely aggressive and refused to feed voluntarily for almost two years. Once it began feeding, it took rats or rabbits with equal gusto. I was able to breed it a few months later. I raised a group of the resulting heterozygous offspring and bred these retics to produce the first captive-born albino retics in 1999. The original snake eventually became tame without any more human interaction than was necessary to feed it and service the cage. This snake was about 9 feet long at the time of import and remains less than 10 feet long today. All of these snakes are tame and have maintained good dispositions. Interestingly, there was wide variation in the appearance of the albino offspring I produced. All exhibited a bright orange and yellow pattern, but their ground color varied from white to lavender to deep purple. These types are strikingly different from each other but are all produced from the same genetic mutation. It is possible that other factors may influence the way the trait is expressed. Hopefully, we'll learn more about this as more of these snakes are produced. During the late 1990s, two other types of albino (amelanistic) retic pythons were imported. These snakes also originated in Malaysia. The first type had extensive white areas with portions of the pattern highlighted in bright lemon yellow. This form has beautiful red eyes. I call this mutation the "Type 2 albino." Three retics of this type have been imported into the U.S. I hope to breed the heterozygous snakes from one of these albinos to produce albino babies next year. The third type of albino is a trait I call "blond." These snakes exhibit much less white and deeper colors than the other types, but still lack any black coloration. The eyes are yellow with dark pupils. This trait is similar to mutations in other species. The blond Burmese and the caramel ball python appear to be the same. I have a wild-caught pair of these snakes and may be able to breed them next season. A third snake of this type was brought into the U.S. but has since died. It is popular to classify albino snakes as t+ or t-, referring to the presence or absence of tyrosinase, an enzyme necessary for the production of pigment. Snakes with deeper colors or snakes that show the lavender colors seen in many albino retics are said to be t+, while those that are yellow and white are said to be t-. No pythons have been tested for this enzyme and it is pure speculation to classify the snakes in this way. According to popular wisdom, the appearance of one of the three forms of the original albino strain would be classified as t+ and another t-. Both types are the result of the same mutation in the same gene. I imported an interesting striped reticulated python from a dealer in Indonesia in late 1996. The snake was about 3 feet long and not completely unfriendly. She grew slowly over the next few years and has produced eggs each of the last three years. Last season, I learned of a similar snake in the United Kingdom that had also been imported from Indonesia. I acquired that snake and bred it to my female. This breeding produced a small clutch of eggs that hatched striped babies. The trait is recessive but is similar in appearance to the co-dominant tiger trait. These snakes have different patterning on their sides, have unmarked yellow heads and develop a nice silvery blue ground color as they mature. Both parents are small, although not young. The male weighs 15 pounds and the female only 22 pounds. These snakes obviously breed at a small size and may, in fact, be dwarfs. I'm also now working with a female black reticulated python, another Indonesian import. It is almost totally black with a few lighter-colored flecks around the head. The snake is nearly patternless, has black eyes and is extremely iridescent. It does not appear to have any yellow pigment. I don't know if this trait is genetic and it's likely that it will take two generations of breeding to find out. Calico reticulated pythons are extremely variable. These snakes may have white patches or be almost completely white. Some have no black pigment and others may exhibit some black or brown flecks or spots. They usually have dark eyes and, to my knowledge, all are females. The color may or may not be stable; some have made dramatic color changes. I have a female retic that has been in my breeding colony for 10 years that developed white patches and became a shade or two lighter this year, then regained nearly normal coloration several months later. Apparently, this trait is not genetic, although its cause in unknown. A number of these animals have been imported into the U.S. I've made some progress combining some of the reticulated python traits. I'm currently working with tiger retics heterozygous for each type of albino and plan to eventually produce super tigers with each trait. The black type seems to have no yellow pigment and if this trait is genetic might help to eventually produce a totally lavender or white snake when bred to an albino. Some interesting offspring might also develop from breeding the striped trait into some of the other types. By breeding the original albino strain to one of the dwarf island forms, I've been able to produce some dwarf albinos. These snakes hatch at only half the weight of the mainland types and remain smaller than the larger sized types at a similar age. I've also bred the tigers to a dwarf type, produced dwarf tigers and bred these animals to the dwarf again, further reducing the size of the offspring. Reticulated pythons are becoming increasingly popular and it seems like there will soon be a size, color and pattern to please every herper's taste. Although the largest retics may not be for everybody, they are great animals and can make a spectacular addition to the collection of anyone who is prepared to deal with them.